Margaret Ann Brooks, 85, of Oak Ridge, passed away Thursday, March 28, 2019 at the Methodist Medical Center. She was born September 25, 1933 in New River, the daughter of Eugene and Elsie Ross McGill, whom have preceded her in death. Mrs. Brooks was a graduate of Oak Ridge High School, class of 1952. She received her Associates Degree in business from Roane State Community College. She worked for 28 years at the Y-12 Credit Union where she was Financial Services Manager. She was a long-time member of Robertsville Baptist Church where she taught Sunday School and enjoyed participating in church activities. She was an avid reader and loved playing canasta, working crossword puzzles and bowling. She is survived by husband, Johnny A. Brooks with whom she would have celebrated 63 years of marriage on October 11th. 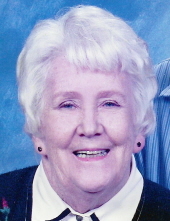 She is also survived by son, Johnny Brooks of Knoxville; daughter Barbara Conger (Greg) of Jacksonville, FL; brother Jimmy McGill of Oak Ridge; sisters, Mary Vroom (Dennis) of Chattanooga and Jean Mashburn (Charlie) of Kentucky; 2 grandchildren, Jessica Brooks (Clark) of Coalfield and Eric Conger of Texas and great-granddaughter Carley Brooks. The family will receive friends on Wednesday, April 3, 2019 from 5 – 7pm at Weatherford Mortuary. The funeral will follow at 7 pm with Pastor Brian Scott officiating. Family and friends will meet on Thursday at 10 am at Oak Ridge Memorial Park for a graveside service. In lieu of flowers, memorials can be made to the Pat Summit Foundation, 520 W Summit Hill Dr., Suite 101, Knoxville, TN 37902. An on-line guest book can be signed at www.weatherfordmortuary.com. To send flowers or a remembrance gift to the family of Margaret Ann Brooks, please visit our Tribute Store. "Email Address" would like to share the life celebration of Margaret Ann Brooks. Click on the "link" to go to share a favorite memory or leave a condolence message for the family.